IFA 2012 may be just begun but Sony already unveils a lot of news products in different sector. There are new 4K HD TVs, Cameras and yes, Android phones. Among all the phones Sony unveils today, Xperia T is the leader in specs sheet. The Xperia T has a 4.55-inch Reality Display having 1,280 x 720 resolution. Sony proudly calling it the "best HD experience on a phone to date." This experience is claimed mainly due to the fact that you can view videos in full 1080p HD quality. The Xperia T runs on Ice Cream Sandwich, but don’t worry, I am sure that it will run Android 4.1 Jelly Bean soon. Sony used Qualcomm MSM8260 chipset in Xperia T, meaning a dual-core Scorpion processor at 1.5GHz with Adreno 220 GPU and 1GBof RAM. It also features a 13MP fast capture camera (with a camcorder capable of 1080p video capture) and boasts a feature Sony is calling Sleep to Snap, which means you can go from a black screen to taking photos in an instant. A one-touch function with NFC which you can use to tap to connect to other Sony devices, a 60-day premium trial of Music Unlimited and a new tier called Access which will be available in Europe for 0.99 Euros per month and will deliver full access of the service to PCs and the PS3. The Xperia T measures 129.4 x 67.3 x 9.35 mm and weighs 139g. The phone features quad-band 2G and penta-band 3G connectivity. It comes with 32GB of built-in storage, which you can expand through the microSD card slot. The Xperia T, which will be known as the TX in select markets, and should be launching globally over the next few weeks. It will be available in black, silver and white hues. Pricing is still an unknown but I know one thing that may be important enough to make anyone interested to buy this handset. James Bond himself will be using the Sony Xperia T in the upcoming Skyfall movie. 29 August, 2012 – Berlin, Germany – Sony Mobile Communications ("Sony Mobile") today announced a new range of Xperia™ smartphones, along with the first Xperia Tablet from Sony Corporation at the consumer electronics show IFA. Featuring in the upcoming James Bond cinema release Skyfall, Xperia T (also coming in a variant known as Xperia TX for some specific markets) is the new global flagship model, providing Sony's best HD smartphone screen, camera and easy 'One-touch' functions enabled by NFC (Near Field Communications). Xperia V shares many of the same great features with Xperia T, but is also LTE enabled for superfast network performance and comes with the highest level of water resistance in smartphone. Xperia J has eye-catching design with a stand-out screen size for consumers looking to combine great style with affordability. Xperia Tablet S brings Xperia to the world of tablet for the first time. Xperia T will launch globally over the next few weeks. Xperia V and Xperia J will launch globally in calendar Q4 2012. Xperia T and Xperia V combine Sony's best screen, camera and connectivity to provide consumers with the best HD experience with which to enjoy content on any screen, any time. 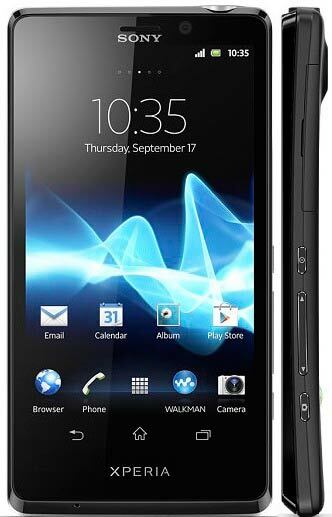 Xperia T, Xperia V and Xperia J build on the same design language first introduced by the award-winning* Xperia arc and Xperia arc S – combining a slim form factor with an emphasis on the display for excellent viewing. Sony's media applications ("WALKMAN®", Album and Movies) combine the best of Sony's technologies and connect consumers to a variety of entertainment services. They form an integral part of the UI on Xperia smartphones, tablets and VAIO PCs to deliver a consistent and superior entertainment experience. Through the "WALKMAN" application, consumers can easily enjoy Sony's recommended sound in ultimate clarity and presence across the entire spectrum of sound by just activating Sony's ClearAudio+ mode***. A wide variety of music can be accessed from this application, including consumer's music stored in their PCs, a list of songs "liked" by a consumer's Facebook friends and millions of songs through Music Unlimited. The Album application combines an intuitive user interface that enables consumers to view, sort, and share pictures with an ability to consolidate photos posted on social media such as Facebook. Consumers can enjoy video content in high picture and sound quality through the Movies application. It also provides movies synopsis from the rich database of Gracenote. Sony is putting NFC at the heart of content sharing through its 'One-touch' function, taking NFC beyond the traditional uses such as eticketing and payments. Now, consumers can easily and instantaneously enjoy their music and photos across an array of NFC enabled Sony devices, by simply touching one to another to establish a wireless connection without a cumbersome pairing process. For example, Xperia T and Xperia V users can stream music wirelessly with 'One-touch' to the new Sony SRS-BTV5 NFC enabled speaker, also announced today at IFA.